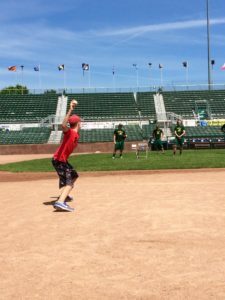 TDS welcomed baseball and softball players ages 5-14 years old from the Madison, Wis. area to the Duck Pond, home of the Madison Mallards, for a Little League Clinic. 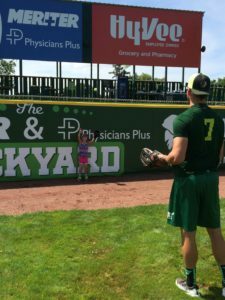 With the help of the Mallards team, the little leaguers were able to play catch, field grounders, catch pop flies, and hit balls in the batting cages —but one of the most popular activities was a particular pitching drill. The little leaguers had to try and throw the baseball to knock a cup off of a chair, to test whether they could make a perfect pitch from yards away. With each activity there was a Madison Mallards player to coach and share helpful tips for becoming a better athlete. Teagan, a softball player, mentioned she learned to get her body in front of a pop fly ball. This expert hint helped her snag each of Alex Smith’s, Mallard pitcher, pop flies in the outfield. 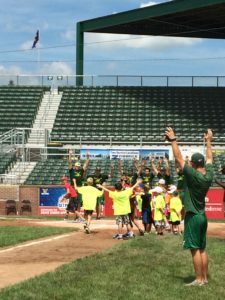 There were smiles all around at the Little League Clinic as the day came to a close—the kids ended their day by running the bases while showing the Mallards their duck wings as they rounded third base before enjoying a ballpark meal and prize drawing. Seven attendees received three tickets to an upcoming game and one family won a 50” HDTV, courtesy of TDS! TDS wants to thank the Mallards players and the coaches for making the clinic a huge success!